Join us at Elsmere Barbecue for a Non Profit Night fundraiser to benefit The Children’s Nursery School ! A portion of proceeds between 4 and 9 pm will be donated to The Children’s Nursery School. Learn more on our Facebook event. Are you or someone you love looking for a special preschool to call your own? Join us at our open house this Friday to learn about our unique co-op community! A place where parents, kids, and teachers join together to promote early learning, heartfelt connections and old-fashioned play! What if you could refer to your child’s school as a castle? According to some of our students the historic State Street Church, where the Children’s Nursery School (CNS) is nestled within, looks like a castle, which makes it even more fun to stay and play every day. Visit us during the early hours of Portland’s First Friday Art Walk. 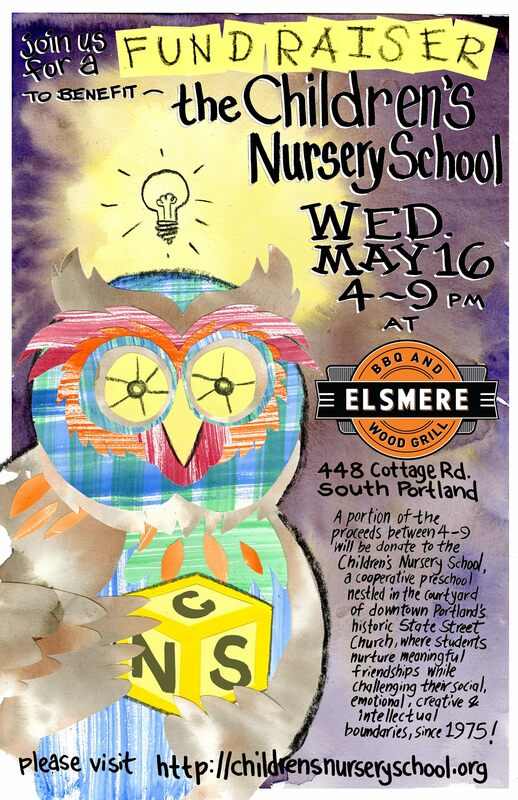 Bring your kids for an art playdate inside our Waldorf, Montessori and Reggio Emilia inspired classroom or, if the weather permits, let them experience our outdoor music wall, see our magical fairy houses and build some more or simply let them have fun with our big bubbles while you can find out why CNS is a favorite among Greater Portland’s parent community. We look forward to meeting you! Click here to RSVP!